PHARMACEUTICALS AND HEALTHCARE: HARD NUT TO CRACK! There are a plethora of factors affecting contemporary pharmaceutical product performance, the challenges are many and it is not an easy road to profit anymore. Net price, more competitors, unbranded and branded generics available at pharmacies at a rock-bottom rate (these are not promoted to doctors), jan aushadhi scheme for low cost generics…all these are affecting product performance. This makes the pharma market a hard nut to crack, for pharma marketers!! The pharmaceutical market is Rs. 1 lakh crores (non-institutional retail pharmacy market for prescribed medicines; the institutional segment and generics not promoted to doctors are additional markets). It has taken 70 years for India to reach this figure, and pharma pandits say the next Rs. 1 lakh crores will come in 7 to 10 years! As per AIOCD AWACS Oct 2016 report, the Indian pharma market is Rs. 105667 crores with a value growth of 10.23%. So brace yourself for more pharma growth and more competition. 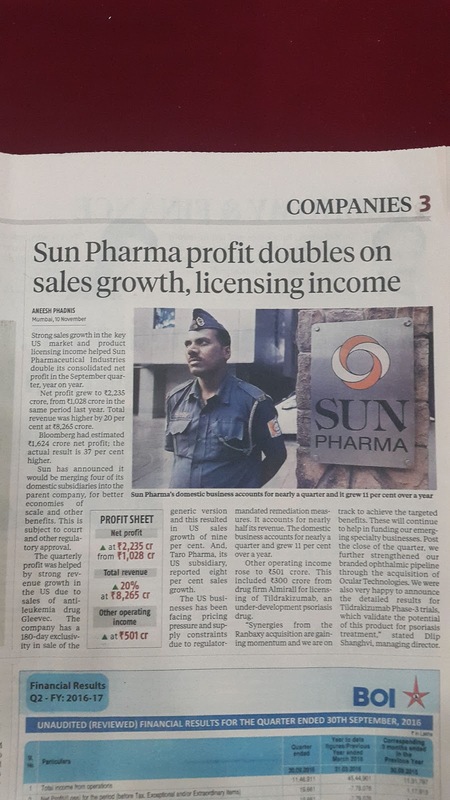 Sun Pharmaceuticals has posted amazing sales and net profit results for the quarter July-Aug-Sep 2016. For this quarter, Sun Pharmaceuticals has posted Rs. 8265 crores sales with net profit of Rs. 2235 crores, and this works out to 27% net profit!! 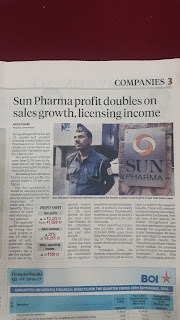 The way Sun Pharmaceuticals is evolving…the day is not far when Sun Pharmaceuticals will launch a blockbuster innovator molecule (a blockbuster achieves 1 billion USD sales in 1 year ie., approx.. Rs. 6700 crores/annum sales globally). A robust pharmaceutical messaging environment means, the company should participate in a calibrated manner with all of above methods of messaging. Relying only on the MR to present persuasive messages will lower the competitiveness of the pharma firm. However, it is not possible to manage pharma sales without MRs unless there is such a unique product which can rely only on print (eg., courier based, and medical journal based) or digital (through websites, doctor oriented social sites etc). All the same it is not possible to simply put all the eggs in the MR basket, overlooking the power of messaging resident in the above alternative messaging media available. Pharma marketing messaging has gotton tougher: thanks to the short attention time of doctors and other opinion builders, shortened MR-doctor interface time, there are also increased expenses and risks to attain objectives, and there is massive clutter in the marketplace (eg., messaging clutter, MR clutter, product and brand clutter, promotional avenues clutter…). Pharma marketing is not a precise science today; it is more of an art ie., creative and appropriate application of scientific principles. Pharma marketing involves juggling with options available in an environment of constraints; eg., How to use the various media for pharma marketing messaging? How much to rely on the MR? How much to rely on digital advertising for product A; and coming to the established product B, will only courier marketing and advertising in medical journals suffice? Can I rely only on booth or stall activity and doctor- to-doctor word-of-mouth for my unique product C? It is quite a challenge for marketers to craft an appropriate objective fulfulling clutter-free marketing approach, at lower costs and lower risks! Thus, each product or set of products will require a well thought out unique approach to create the appropriate media mix to put out persuasive messages. It cannot be that the entire burden of messaging will be on the MR…in today’s times. Thus, marketing has today, become a highly cerebral activity to arrive at the right ‘communication mix cocktail´ as per the product/brand and market profile, and only then will marketing be able to contribute for a pharma company’s sales growth, and net profit growth. Today it is not just about appointing MRs and launching 15 branded pharmaceutical product SKUs…and then this army of MRs will regularly meet doctors to manage relationships with inputs, and these target doctors will generate sales results…pharmaceutical marketing includes this, yes, it does include this – yet pharma marketing has gone beyond that to accommodate other avenues of persuasive messaging as shown in the above graphic. For day-to-day decision making the following graphic will help! Explanation of above graphic: based on our knowledge and insights there will be a certain quality of thinking, which will be applied for decision making. Based on the decision taken, a blueprint or action plan will be crafted. Then comes actualising the action plan (execution of blueprint)…to generate results. High quality knowledge and insights will contribute to above superior sequence of result generation. And this will make it easier to crack the hard nut…the IPM (Indian Pharmaceutical Market). Thanks for reading this blogpost, please scroll down to read other blogposts, click on older posts wherever required to read older yet interesting posts, please do recommend this blog to your acquaintances.